Travel and Tourism are two of the hottest search topics on the World Wide Web and it is now possible to plan and book a whole trip and create your own holiday itinerary. 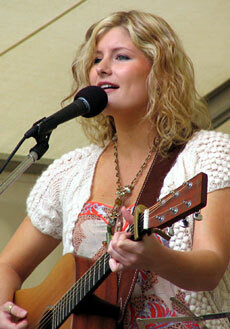 Let's research a visit to the upcoming HATS OFF TO COUNTRY FESTIVAL in Tamworth being held from 6-9 July, 2006. TOURISM TAMWORTH is a great place start with an Accommodation Search facility and online ticket sales for some of the major concerts and a program of events to download. From there you can click through to Weatherzone and find out if you'll need to rug up or not. You might need to get from one place to another, so plan ahead at Tamworth Buslines where you can check the local bus timetables. Next we'll look at some of the venues: THE PUB GROUP are showcasing their forthcoming music program as is the WESTS ENTERTAINMENT GROUP and no doubt more venues will follow suit. 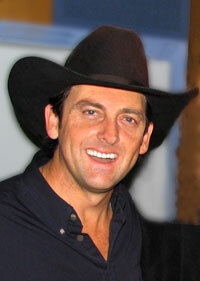 Lastly, some of the artists: LEE KERNAGHAN (pictured above) headlines the major Town Hall concert with his sister Tania and also The McClymonts (Samantha McClymont pictured left). Lee's website has had a terrific major revamp in line with his brilliant new album The New Bush. Late night revellers may like to check out the new site of the Huckleberry Swedes, the alt. country band who conclude their tour with Bill Chambers at the Hats Off festival. 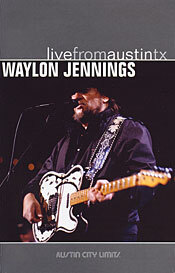 Filmed on April 1st, 1989, this television concert by WAYLON JENNINGS includes many of his 'greatest hits' of the outlaw era, including several nods to his absent compadre, Willie Nelson (Mammas Don't Let Your Babies Grow Up To Be Cowboys and Luckenbach, Texas), including telling the origins of how he wrote Bob Wills Is Still King because he was mad at Willie. This was also filmed at the time when Waylon famously kicked his 20-year drug habit and it shows in this excellent performance that captures him in full force. The band seamlessly trade solos, particularly Waylon himself with his trademark leather-bound guitar and "the best steel player there ever was"...Ralph Mooney. Waylon's wife, Jessi Colter makes a 'surprise' appearance for duets on Suspicious Minds and Honky Tonk Angels and trivia buffs might note that her daughter Jennifer Eddy (from Jessi's first marriage to guitar twanger Duane Eddy) sings back-up vocals in Waylon's band. There will never be another Waylon, as much as we need someone to break the mould the way he did. We miss you, Hoss. Altogether now, Waylon fans: "...boogedy-boogedy-boogedy...woop, woop!"